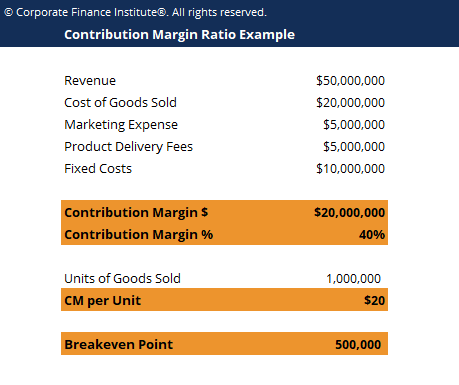 This contribution margin ratio template shows you how to calculate the contribution margin, CM percentage and breakeven point. The contribution margin ratio (CM ratio) of a business is equal to its revenueSales RevenueSales revenue is the starting point of the income statement. Sales or revenue is the money earned from the company providing its goods or services, income less all variable costsFixed and Variable CostsFixed and variable costs are important in management accounting and financial analysis. Fixed costs do not change with increases/decreases in units of production volume, while variable costs are solely dependent on the volume of units of production. This guide teaches an analyst the fixed vs variable cost methods divided by its revenue. It represents the marginal benefit of producing one more unit. Contribution margin is not necessarily a good indication of economic benefit. Companies may have significant fixed costs that need to be factored in. It can be important to perform a break even analysisBreak Even AnalysisBreak Even Analysis in economics, financial modeling, and cost accounting refers to the point in which total cost and total revenue are equal. It is used to determine the number of units or revenue needed to cover total costs (fixed & variable costs) to determine how many units need to be sold and at what to breakeven. In order to perform this analysis, calculate the contribution margin per unit, then divide the fixed costs by this number and you will know how many units you have to sell to break even.